John Francis Anthony Pastorius III (December 1, 1951 – September 21, 1987), better known as Jaco Pastorius, was an influential American jazz musician, composer and electric bass player. Pastorius' playing style was noteworthy for his playing intricate solos in the higher register and for the "singing" quality he achieved on his fretless bass. His many innovations with the electric bass included his use of harmonics. Pastorius suffered from mental illness including a substance-related disorder, and was diagnosed with bipolar disorder in 1982. He died in 1987 at age 35 following a violent altercation at a Wilton Manors bar. Pastorius was inducted into the Down Beat Jazz Hall of Fame in 1988, one of only six bassists so honored (and the only electric bass guitarist). 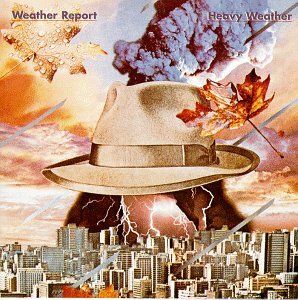 Heavy Weather is the eighth album by Weather Report, released in 1977 through Columbia Records. The release originally sold about a half million copies which would prove to be the band's most commercially successful album. Some consider it to be Weather Report's best album artistically as well. Heavy Weather received an initial 5 star review from Down Beat magazine and went on to easily win jazz album of the year by the readers of that publication. It is the band's second album with bassist Jaco Pastorius. Weather Report was an American jazz fusion band of the 1970s and early 1980s. The band was co-led by the Austrian-born keyboard player Joe Zawinul and the American saxophonist Wayne Shorter (and, initially, by Czech bass player Miroslav Vitouš). Other prominent members at various points in the band's lifespan included Jaco Pastorius, Peter Erskine, Alphonso Johnson, Victor Bailey, Airto Moreira and Chester Thompson.